I have developed something of an...addiction to scones. It seems that I cannot get enough of them! I have mentioned in another scone post that I hate paying the absurd amount for them at cafes and have initiated trying out my hand at making my own scones. I am in scone heaven. It took me several attempts to make these ones though. Then...perfection! 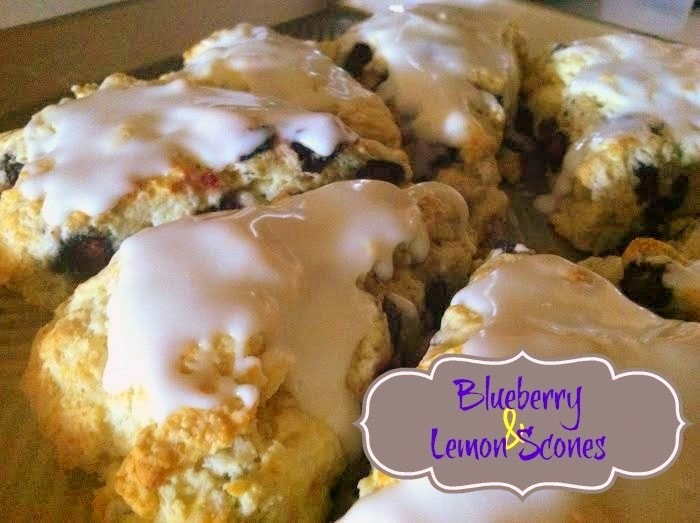 I adapted a recipe slightly from my trusty Better Homes & Gardens Cook Book and these delightful morsels of blueberry (with lemon icing) perfection came out. I have made more of glaze for all my scone attempts, until this one. I decided to leave the icing a bit thicker and I am so glad I did. The lemon flavor really shines through and the bit of tartness with the full blueberry flavor really mesh nicely together. I devoured ate two right after icing them. I rolled these out directly onto my baking pan (which I use my trusty Threshold baking sheet from Target...it is my absolute favorite baking sheet), then I just cut the circle into wedges and slid them apart from each other slightly before baking. 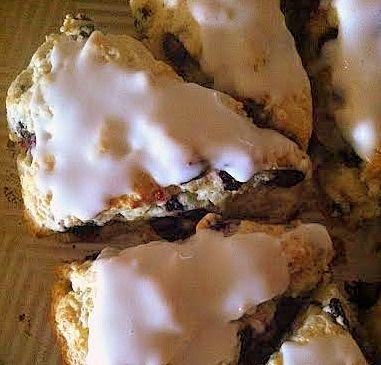 But you could use a scone/wedge pan, or do it on a counter and then place them on a baking sheet. Whatever is easiest for you! You could also add milk to the icing (I didn't for this recipe). I really wanted to taste the lemon, so I used 1 1/2 tablespoons lemon juice in one cup of powdered sugar to create the thick icing. I am so very glad I did! In a small combine the beaten eggs, heavy cream and blueberries. Using a pastry blending, cut in the cold butter until the mixture resembles coarse crumbs. Create a well in the center of the flour crumbs. Add the cream mixture with the blueberries into the well. Fold gently until the flour is moistened and the batter is thick. Roll the dough out onto a lightly floured surface, or a nonstick baking sheet and make into a large disc. Cut into 8 wedges, pulling them apart before baking, or placing apart on a baking sheet. Bake for 10-13 minutes, or until edges are lightly browned and they are no longer doughy. 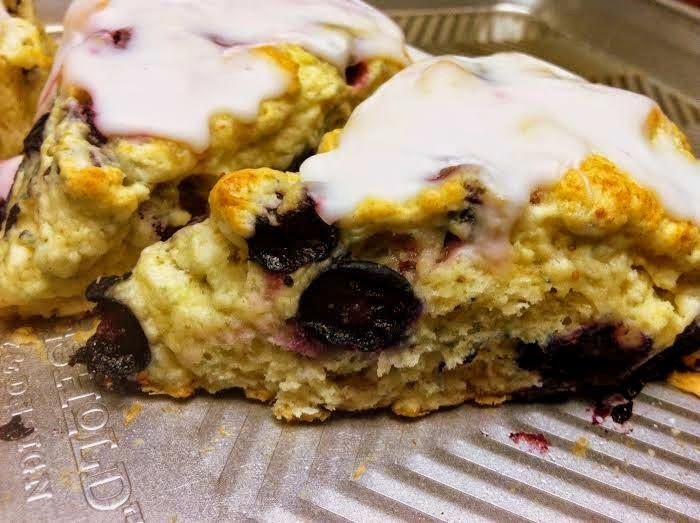 Set out to cool on the baking sheet, or remove the scones to a wire cooling rack with foil or wax paper placed underneath. In another bowl, combine the powdered sugar and lemon juice until desired consistency is reached. Add milk to thin if you wish. Ice the tops of the scones while still warm. Serve warm, and best to be eaten the same day as made.